So who or what is to blame? In short, it is usually new applications that use a lot of bandwidth, or applications that need a lot of memory, which hold up data traffic on the network. IT administrators at companies must promptly see to it that these new applications do not cause the data transfer rate and server response times to plummet. This situation is a hot topic right now given the arrival on the market of a large number of new technologies and business-critical applications that increase the productivity of companies, but also place a great strain on their networks. The good news is that roughly one third of companies have realized the situation and already implemented a 10 Gb/s network infrastructure using Ethernet, with three-quarters expected to have done so by next year. Voice and video over IP applications are some of the biggest guzzlers when it comes to bandwidth. There is nothing more disruptive than when a video lags or your voice breaks up during a video conference, after all. People are never happy to replace old computer equipment while it is still working, but in many cases it is this that is contributing to delays on the IT network. Conversely, modern PCs nowadays have a 1 Gb/s network connection and these place a greater strain on a company’s network as a whole. For many companies it remains a dream for the future, but the arrival of the Internet of Things (IoT) is inevitable. In IoT environments, connected devices and sensors send millions of data packets to central servers and storage units, who then send these back to the end devices, which have to analyze and evaluate them. Last but not least, these extremely large amounts of data have to be backed up, replicated and, where necessary, restored. This can take some time. There are allegedly still companies who only back up their data once a week, at the weekend, because one night is not long enough to run a full backup. It’s fair to say there is a multitude of reasons for trimming the company network to make it faster. In the past, a 1 Gb/s bandwidth on the network offered the best cost/performance ratio, but there is now costeffective 10 Gb/s equipment available that makes it possible to multiply network output without having to increase the IT budget too much. The following section outlines the measures and devices that will speed up networks. Servers – If your server does not have 10 Gb/s connections, you can find a large selection of NICs (Network Interface Cards) on the internet. These cost between 200 and 300 euros per card. Switches – A large selection of switches is available, offering a wide range of functions, depending on your own requirements, and costing up to 20,000 euros. 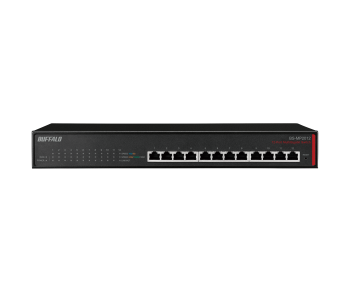 When switching to a 10 Gb/s environment, it is best to use switches that have a basic range of functions and are easy to install (i.e. plug & play), priced at 550 euros upwards. 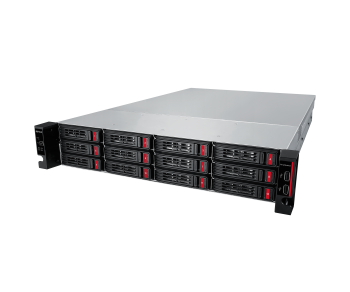 Storage Systems – The NAS systems you use should of course have a 10 Gb/s connection as well as a fast processor and sufficient RAM so that the data can be processed quickly – whether on the file server or during backup. A simple example of 10 Gb/s being implemented is illustrated below: The central servers are connected to the central switches with 10 Gb/s lines, even though the user’s end devices connected to the edge switches have 1 Gb/s. The graph to the right shows you how the speed increases when using 10 GB/s connections, contrasting this with the 1 GB/s transmission speed. 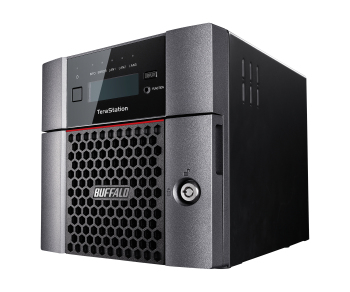 In our laboratory, we compared the write/read speeds with the TS5410, our latest NAS model, to its predecessor, the TS5400. This revealed that the 10 Gb/s connection is around three times faster than the 1 Gb/s line, and also that our top model of NAS achieves much faster speeds than its predecessors. Rapid increases are also achieved in virtualized environments. The iSCSI protocol benefits from the additional bandwidth on the network and can run more virtual machines. Our tests prove that more than double as many write IOPS and more than 50% read IOPS are performed via iSCSI with a 10 Gb/s connection, compared to a 1 Gb/s connection. Using the 10 Gb/s connection made it possible to increase the number of “participating” PCs with simultaneous access to the NAS from 40 to 57.